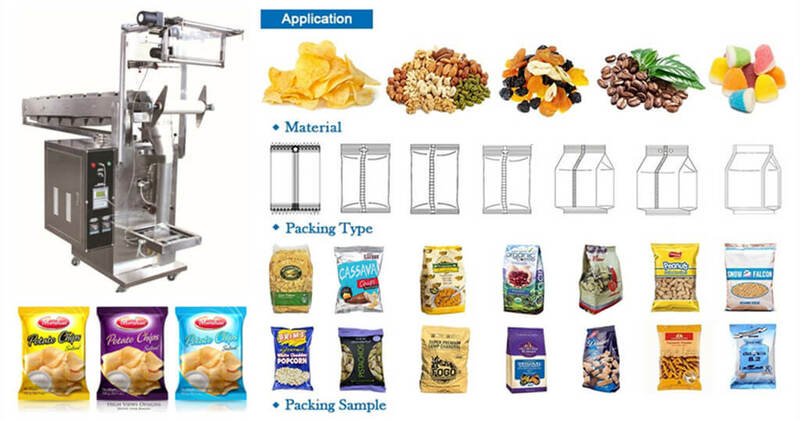 Amisy granular packing machine is a kind of chain transfer packaging machine, it has the function of automatic bag making, blanking, measure, count, sealing and photoelectric trace. 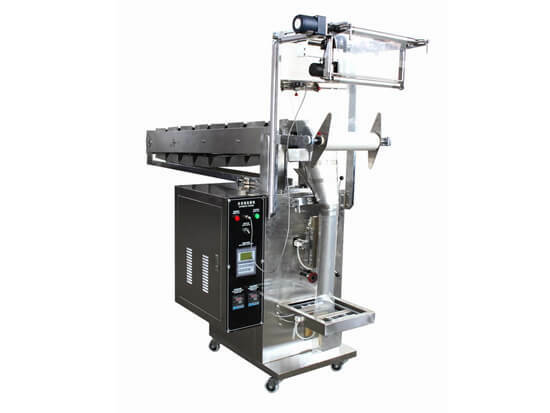 This granular packing machine is suitable for automatically packing granular materials of foodstuff, medicine, seeds, and chemicals. 1. Made of stainless steel, comply with GMP requirements, clean and healthy. 2. PLC controller, advanced CPU, best power supply, all the parameters can be installed and adjust easily. 3. Accurate photoelectric trace, the speed is 20-70 bag/min, the error is less than 0.5mm. 4. The length of the bag is set by the computer, no trouble at changing the gears and adjusts the length by hand. 5. The alarm function can specify output and display the packing speed. 6. With the printer, it can print number, best before date, production date according to your selection. 1) Food stuff: potato chips, sugars, instant food, puffed rice, salt, etc. 2) Seeds: millet, mung bean, rice, sesame, peanut, etc. 3) Medicine: medicinal granules, Chinese herbal medicine, etc. 2. Packing material: hot sealing composites, such as Cellophane/PE, BOPP/PE, PTP/PE, etc. Granule packing machine repair and maintenance is essential for long time use. 1. Regularly check the parts once a month, found the defects should be repaired in time, it may not be reluctant to use. 2. The packing machine should be placed in a clean dry indoor to use, not in the place where the atmosphere containing acid and other corrosive gas. 3. If stop to use for a long time, keep the body of the machine clean, parts of the surface coated with anti-rust oil.